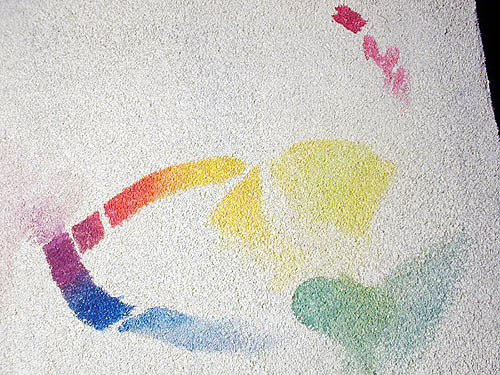 Making Safe Water Colors for kids. My vegetable pigment colors arrived today from Florence. The saffron which is a perfect O/s Indian Yellow, the Magenta and the lacca purple are really the cool magenta hue used to make ultramarine blue with the cyan, it bleed in fresco but it's usable in secco. Today I ordered some indigo. The forth important color is burnt sienna. 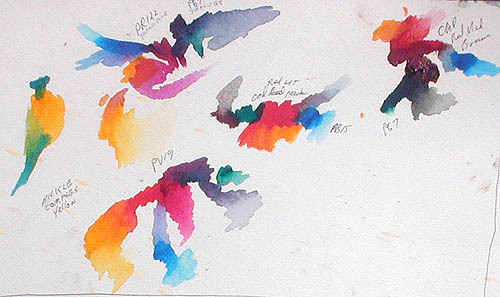 I made a palette of these pigments in water colors using combinations of gum Arabic, linseed oil emulsified soap, oxgall and honey, a natural preservative. Bocour made a cobalt Violet phosphorous transparent around 1960 and before, the color disappeared because it blead in oil. The lacca purple is the color they were copying in synthetics and it bleeds also. Transparent Magenta is two colors, a cool and warm. one for mixing reds and one for blues. Transparent yellow is also two colors, an orange to yellow for making reds and a brown to yellow for the lower scale mixtures of yellow like blue and green. Brown is dark yellow. Both are called Indian Yellow because in 1900 Indian Yellow from cows eating mango leaves made these yellow colors the best, others were saffron, pomegranate, and beech wood bark. Saffron is the color replaced by cow's urine, W/N kept it a secret for twenty years 1880-1900. All other transparent yellows were replaced by Indian yellow. We as artists lost the value of this color during the wars. 1870, Franco-Prussian War, 1914-1918, The First World War. 1939, 1945, WWII, this was GROUND ZERO, ART WAS NOWHERE. Add that to the Ostwald opaque color theory which added black to darken colors and you get what is still being taught in schools today. 1916, THEORY, The last color wheel (square) of college record was by Church-Ostwald. It has Yellow, Red, Sea Green and Ult. Blue at the corners. It made way for the new coal-tar colors, all pigments were replaced by there top-tone matching colors. Opaque Red, yellow and blue are not primary colors, transparent yellow, magenta and cyan are. Indian Yellow O/s hue makes yellow and red with magenta. This is the same color as Saffron organic vegetable. 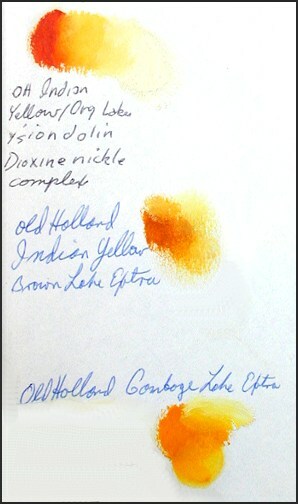 Indian Yellow br/s hue is good for greens and dark brown yellows. This is 2004 D.S. 's nickle complex New Gamboge with PR122 magenta, PV19 warm magenta and PB15 cyan. Cadmium Red Mediium leans to the magenta side so I included it in this chart. FRESCO 3 COLOR TEST PHOTO FROM NY MURAL, 2004. The reason magenta PR122 works so well is that in mixes it makes reds, blues and neutral with it's opposit color Thalo green. PV19 makes stronger reds but weaker blues. PB15 is the only pure cyan and is necessary for a full sky.